The Gartner Magic Quadrant has long been recognized as critical research that organizations rely on to weigh, evaluate, and ultimately select vendors as the infrastructure for their IT initiatives. 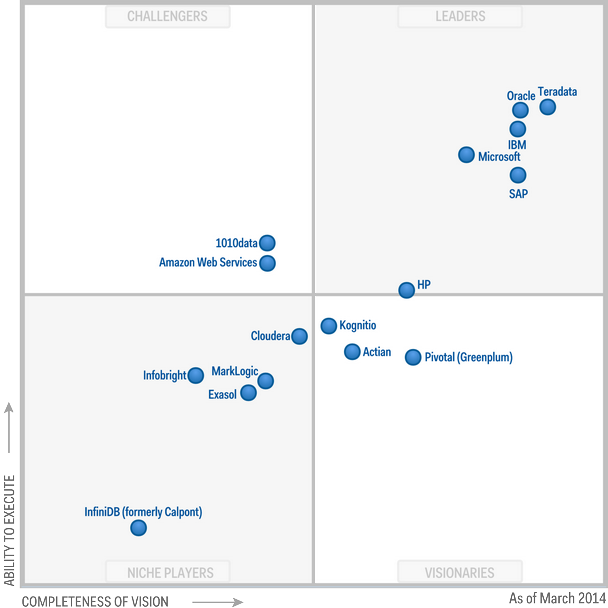 Gartner has released the 2014 Gartner Magic Quadrant for Data Warehouse and Database Management Systems. Entering 2014, the hype around replacing the data warehouse gives way to the more sensible strategy of augmenting it. New competitors have arisen, leveraging big data and cloud, while traditional vendors have invested — which will force improved execution from new technology companies. Next story 2013 Gartner Magic Quadrant for Operational Database Management Systems . ￼Technology solutions for managing and computing on large-scale biomedical data.